Aggressive behaviour is a primary symptom of conduct disorder and is one of the strongest predictors of criminality in individuals with conduct disorder. There is a need for appropriate interventions targeting aggressive behaviour among adolescents with conduct disorder that is relevant to the diverse South African population. Occupational therapists can utilise drumming as an occupation-based intervention medium to this end. This study reports on the short term effect of a group drumming intervention programme for aggressive behaviour among adolescent girls (13 to 18 years) diagnosed with conduct disorder at a school for girls with behavioural problems in the Free State. An experimental, randomised pre-test post-test control group design was used. The intervention group (n=13) was exposed to a three week drumming intervention while their matched controls (n=13) continued with their normal daily programme. Both groups completed the Aggression Scale questionnaire before and after the intervention. The median Aggression Scale score of the intervention group showed a marked decrease from 20 to 7 from the pre-test to the post-test, although this difference was not statistically significant (95% CI [-13;5]). The median difference between the post-test scores for the control and intervention groups did, however, reveal a statistically significant difference in the levels of aggression experienced by the respective groups after the intervention (95% CI [-28;-3]). This study therefore delivered promising results suggesting that group drumming can be an effective intervention for the reduction of aggression among adolescent girls diagnosed with conduct disorder. Violence and aggression are major concerns worldwide. According to the World Health Organisation's World report on Violence and Health1 an estimated 1.6 million people are victims of violence each year. The annual rate of violent deaths (homicide) in the African region is reported to be 22 persons per 100 0001. In South Africa (SA), Donson2 compiled a profile of fatal violence-related injuries which confirmed the global findings that adolescents and young adults are the main victims and perpetrators of aggressive acts leading to death. The National School Violence Study3 which investigated the frequency of victimisation in South African school settings found that more than 48% of learners experienced threats of violence at least once. Furthermore, based on a representative sample of 5 939 South African secondary school learners from various socio-economic backgrounds, 24% of the learners reported that they had been assaulted at least three or more times at school. A comparison between the 2008 and 2012 results of the aforementioned study, indicated that violence and aggression in schools remained a consistent concern in SA over this time period. When a child's behaviour, including but not limited to aggression and violent behaviour, cannot be managed by his or her parents or legal custodians, the Children's Court of South Africa appoints the child to a school of industries as stipulated in the Child Care Act (Act 74 of 1983)4. One of these boarding schools is situated in Bloemfontein in the Free State and provides such a court appointed regulatory service to adolescent girls who have been diagnosed with conduct disorder. Conduct disorder is defined as a repetitive and persistent pattern of anti-social and aggressive behaviour that results in the violation of the basic rights of others and lack of age-appropriate societal norms5. The diagnostic criteria of conduct disorder can be divided into four core symptom groups, which are (a) aggression to people and animals, (b) destruction of property, (c) deceitfulness or theft and (d) serious violation of rules5. One of the primary symptoms of conduct disorder is aggressive behaviour6 and was identified as a major area of concern among the learners attending the school where the study was conducted. A meta-analysis of intervention programmes aimed at reducing aggressive behaviour in schools revealed that a cognitive-behavioural treatment (CBT) approach is commonly used. The study concluded that CBT is a moderately effective intervention for aggression in children and adolescents7. However, Wright, Day and Howells8 identified several problems with the CBT approach, which included the implicit requirement for introspective ability and self-awareness. These authors argue that when an individual lacks self-awareness they will find it difficult to choose an alternative conscious response to a trigger stimulus. Cognitive behavioural interventions are therefore also less effective when individuals are impulsive and react too quickly in choosing an alternative conscious response. According to Vorster9, individuals diagnosed with conduct disorder generally lack self-evaluative insight. They tend to become involved in high risk, impulsive behaviour without consideration for the consequences. They generally display low frustration tolerance associated with highly reactive behaviour to perceived injustices and/or emotionally charged situations. In addition, individuals with conduct disorder usually present with poor self-regulation abilities9. Based on these limited self-reflexivity and self-regulatory abilities it is unlikely that traditional approaches to anger management and reduction of aggression, such as CBT, will succeed with this population. As an alternative intervention for aggression in adolescents, Bittman, Dickson and Coddington10 and Currie and Startup11 explored group drumming as a therapeutic medium with promising results that supported the reduction of aggression among adolescents following this intervention. A perusal of literature revealed that treatment interventions for aggressive behaviour focused largely on boys with comparatively few studies focusing on the treatment of conduct disorder in girls12. Therefore, considering the high prevalence of school-based violence in SA, and the potential of collective drumming as a therapeutic intervention revealed in prior studies, the question arose whether group drumming could be an effective occupation-based intervention for the short-term reduction of aggression among adolescent girls diagnosed with conduct disorder within the South African context. The theoretical investigation into the study topic encompassed gaining better understanding of adolescence, the relationship between anger and aggression, and the therapeutic value of drumming as an effective intervention for the reduction of aggression in adolescent girls with conduct disorder. Adolescence is the period of transition between childhood and adulthood. The age at which adolescence starts and ends can differ based on socio-cultural, biological and individual differences13. For the purpose of this study, adolescence included learners between the ages of 13 and 18 years. One of the most important tasks of adolescents' emotional development is learning to deal with anger effectively and discovering ways of expressing it in a socially acceptable manner14. Adolescents with conduct disorder have impaired socio-affective processing and cognitive control15. Consequently, this may lead to negative effects in various aspects of life, such as threatening behaviour that often escalates to actual harm to the self, others and/or objects. Poor work performance, negative social experiences and decreased participation in activities of daily life are also associated with conduct disorder among adolescents16,17 and is often evidenced by severe occupational imbalance, alienation and marginalisation. The consequence of impaired socio-affective processing, such as the ineffective regulation and handling of anger and aggression, thus places adolescents with conduct disorder at high risk for occupational ill-health, that in most cases have long term negative effects. Dealing with anger is one of the greatest challenges faced by adolescents with conduct disorder. Anger is defined as a multidimensional experience arising from an external trigger with associated physiological, cognitive and environmental components that gives rise to various behavioural responses18. The complexity of the process that gives rise to these behavioural responses can be better understood if the relationship between anger and aggression is illustrated. Figure 1 provides one such depiction compiled by the researchers. As depicted in Figure 1, aggression is viewed as a possible behavioural response to anger. Aggression is defined as behaviour that is intended to harm or injure24 and may be aimed at others, the self or an external object25. Aggressive behaviour can be physical, direct verbal and indirect26. Indirect aggressive behaviour may result in harming a victim's social status, self-esteem or both27. Girls with conduct disorder are more likely to engage in indirect and direct verbal aggressive behaviour rather than being physically aggressive28. 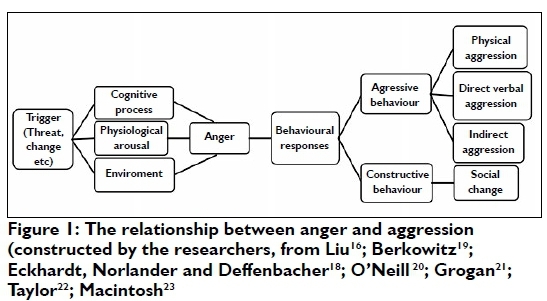 When referring to Figure 1, it is clear that the behavioural responses to anger do not necessarily involve aggressive behaviour, but can also lead to constructive responses such as self-assertiveness resulting in social change16. Interventions can thus be aimed at targeting the components associated with anger such as physiological arousal, the environment, the cognitive processes or at facilitating constructive behavioural responses to anger instead of resorting to aggressive behaviour. Evidence-based interventions that focus on the environmental components such as multi-systemic therapy and parent-management training require extensive resources to implement and are often not feasible to implement in low-resourced developing countries such as South Africa29,30. Many interventions for conduct disorder emphasise a behavioural approach often in a group context30. After considering alternative interventions for aggression in adolescents, group drumming emerged as a potentially powerful medium. Group drumming may facilitate changes in all the angeraggression mechanism components associated with aggression in adolescents with conduct disorder, as will be explained in the following sections. Little research has been done on the efficacy of group drumming for the reduction of aggression in adolescents, however, two studies found that group drumming resulted in a statistically significant decrease in aggressive behaviour10,11. In addition to promising results from previous studies there are various theories which support the hypothesis that group drumming may be an effective alternative intervention. The rationale for the use of group drumming as an occupation-based intervention for the reduction of anger and aggression in this study is based on Bandura's theory of self-efficacy31, Yalom's curative factors32 and drumming as an occupation33, each of which are henceforth considered briefly. Drumming has the potential to increase an individual's self-efficacy through opportunities for the participants to experience mastery, modelling, social persuasion and a positive emotional state31. Adolescents with conduct disorder tend to have a low self-esteem, a negative view of themselves and emotional instability due to repeated rejection by parents or authority figures34. Drumming can be graded in order to achieve mastery through continuous repetition and practice. In a group, social persuasion and modelling occur as group members encourage and learn from one another through providing positive feedback and establishing norms which govern social inter-action. Through this kind of interaction, members can achieve a greater level of self-awareness and insight which facilitate social learning35 and self-understanding. Research has shown that interventions allowing for social inter-action with peers are effective for girls as girls are influenced emotionally by their peer relationships36. As individuals feel more confident in their ability to deal with difficult situations, they may be more inclined to act in a constructive manner. People who mismanage their anger, such as adolescents with conduct disorder, tend to have an external locus of control and believe they are unable to control their anger21. Self-efficacy strengthens the individuals' belief in their angermanagement skills by providing them with an internal locus of control. They are no longer controlled by their anger and can choose their responses instead of reacting impulsively. Self-efficacy has the ability to influence the trigger-anger-response mechanism (refer to Figure 1) via the cognitive processes and the physiological arousal. Drumming allows the person to have a positive somatic and emotional experience. Anxiety is reduced through the rhythmic movements produced which have a calming effect on the person's physiological arousal (refer to Figure 1), potentially leading to improved anger management33 and impulse control37. Through group drumming, members may experience catharsis which is the uninhibited expression of emotions followed by the experience of relief32. This may also have an influence on the physiological arousal produced by an external trigger/threat and is one of the curative factors identified by Yalom and Leszcz32. The feeling of universality and group cohesiveness are two other curative factors identified by Yalom and Leszcz32 which may lead to reduced aggression when used in a group drumming session, thus enhancing the therapeutic value of the session. Group members may experience a feeling of universality which is the recognition of shared experiences. Members can give expression to their emotions in the drumming group where it is validated thus decreasing feelings of isolation, increasing group cohesion and fostering community37. Group cohesion occurs when members feel a sense of belonging and acceptance which alter the person's subjective experience of himself/herself in relation to the environment. This in turn creates a feeling of togetherness. When given the opportunity to participate in drumming, an adolescent can express strong emotions constructively. This may reduce the need to inflict harm upon others37 which is a symptom of conduct disorder. ✥ The development of emotional regulatory and social skills. ✥ Experiential learning for the attainment of performance skills to be mastered. ✥ A feeling of personal causation leading to valuable contributions to society. ✥ Increased self-awareness and orientation to reality. ✥ A sense of responsibility from the individual for the quality of the collective end product. Emotional regulation, especially the regulation of anger amongst adolescents, is a problem in the South African context2. A need to identify interventions for aggression that are appropriate for the South African context and can include people from different socioeconomic and cultural backgrounds with varying levels of literacy and needs has been highlighted. Group drumming is an occupation that is appropriate for South Africa's multi-cultural population and has the potential to facilitate constructive responses to anger. It is a potentially powerful therapeutic medium for occupational therapists to use in intervention with adolescents with aggressive behaviour as a symptom of conduct disorder, and this study aimed at determining the short-term effectiveness of this intervention. The purpose of this study was to determine the short term effect of a group drumming intervention programme on aggression among adolescent girls at a school for girls diagnosed with conduct disorder in Bloemfontein in the Free State. Permission was obtained from the Free State Department of Education, and informed consent was obtained from the school's principal, as the legal guardian of the girls in the school, for conducting the study. Participants gave assent for their own participation in the study. Ethical clearance was obtained from the Ethics Committee of the Faculty of Health Sciences of the University of the Free State. The study utilised an experimental, randomised pre-test posttest control group design38. The Aggression Scale (AS)39, a self-report assessment of aggressive behaviour, was used as a measuring instrument. The assessment tool was designed by its authors to be used for the evaluation of interventions aimed at violence prevention in schools, making it a very suitable tool to be used in this study. According to Orpinas and Frankowski39, the AS has high construct validity (p< 0.0001) and high internal consistency with a Cronbach's alpha coefficient of (0.87). As a measure of reliability, the AS test-retest scores were stable over time39. The AS contains eleven concrete questions that refer to the learner's behaviour a week prior to the date of testing. On the AS, the participants indicated the frequency of the behaviour described in each question, ranging from zero to six or more times. A total score (maximum of 66) was computed by adding the frequency reported for each question. This indicated the total number of aggressive acts committed within a week40. The school where the study was conducted has a total of 104 learners, all of whom are diagnosed with conduct disorder. The matric class (n=10) was excluded from the study due to important mid-year examinations. A demographic questionnaire and an AS pre-test questionnaire were completed by the rest of the school (n=94) of which sixty-eight learners were eligible to participate in the study based on the demographic data obtained. The other twenty six learners who completed the pre-test were excluded from the study as they were not between the ages of l3-l8 years at the time of the study, did not give assent or had a history of epileptic seizures. The exclusion of learners suffering from epilepsy was necessary as drumming may lower the epileptic seizure threshold8. Following completion of the pre-test questionnaires, 32 learners were randomly selected using a stratified, randomised sampling method. These learners were divided equally into a control (n=l6) and experimental (n=l6) group. The control and experimental groups were matched according to each learners' pre-test score and the type of sport they participate in. Matching according to the type of sport practised, as an individual and/or team41, was important as it has been shown to influence the level of aggression in adolescents42. The experimental group was exposed to ten drumming sessions over the course of three weeks. African Djembe drums were used and each participant was provided with their own drum for the duration of the drumming programme. Drumming sessions took place at the school, in the evenings at a time that would not interfere with any other academic or extra-mural activities. The experimental group was subdivided into two groups of eight learners each in order to make the drumming sessions more manageable. Both experimental groups participated in the drumming sessions at the same time, in two different venues. Each experimental group was allocated one facilitator and one co-facilitator. The two experimental groups and their facilitators remained consistent for the entire intervention period. The facilitators of the drumming groups attended a group drumming workshop in preparation for facilitating the experimental groups. The drumming programme was created with specific aims in order to ensure consistency across the two drumming groups. The aims and sub aims for each session are indicated in Table I. To further ensure consistency between the two drumming groups, a checklist was compiled for each session, which was completed by the co-facilitator of the group. This ensured that all the planned activities and aims were met within the session. Sessions were structured to contain a warm-up, main and closing activity with a total duration of approximately one hour. During this time participants were facilitated to generate group norms, whereafter exploration with the Djembe drum and different drumming rhythms were facilitated (see Table I). At the end of each session, opportunity was provided for the participants to reflect on the session and their experiences thereof. This informed the researchers of possible adjustments to be made to the drumming programme for the following session. During the intervention period, the control group continued with its daily schedule and spent its time in the hostels while the drumming sessions took place. Three of the researchers who did not facilitate the drumming groups supervised the participants in the hostels while these participants participated in leisure activities of their choice. There was no interference from the researchers with the learners in the control group. This was done to ensure that the control and the experimental group of participants were all aware of being part of the study, in an attempt to equalize the effect of being singled out as research participants (the 'Hawthorne effect')43. After the completion of the drumming intervention, the post-test AS questionnaire was completed by both the experimental and control groups. These experimental and control groups were separated into two different classrooms where the participants completed the AS in an identical manner to the pre-test. The control group received three drumming sessions in the week following the post-test to afford them the opportunity to also experience group drumming, although there was not sufficient time before the school holidays for them to participate in the full ten-session programme. The data from the pre- and post-test questionnaires were captured and checked by different researchers to ensure a reliable data set, and the Department of Biostatistics at the University of the Free State analysed the data. Due to the relatively small sample sizes, the data was not normally distributed. Thus the median scores were calculated and the median differences calculated to compare the pre- and post-test scores for the experimental and control groups. Ninety-five percent confidence intervals were calculated to determine the significance of median differences. The study had an initial sample size of 32 participants. Three participants from the experimental group and one matched participant from the control group dropped out of the study due to missing sessions or withdrawing assent. The data from a further two matched participants from the control group thus had to be excluded from analysis to yield a final sample size of 26 participants. The age of the participants at the time of the pre-test ranged from 14 to 17 years (median = 15 years and 8 months) (n=26). The sample consisted of 46,1% black (n=12), 38,5% coloured (n=10) and 15,4% white (n=4) participants. 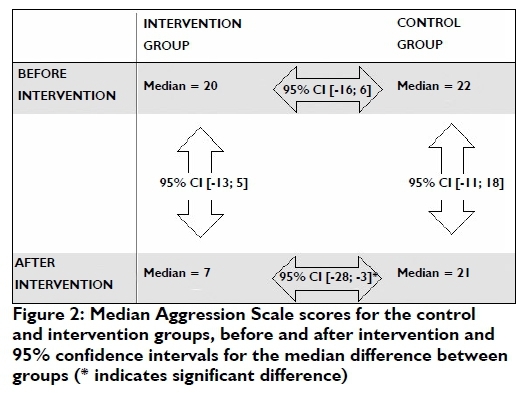 Figure 2 indicates the median Aggression Scale (AS) scores for the intervention and control groups, before and after intervention respectively. The 95% confidence intervals for the median differences between these scores are indicated in the arrows. Although the 95% confidence interval did not indicate a statistically significant difference between the pre and post intervention scores in the intervention group it is still promising to note that 76.9% (n=10) of the participants within the intervention group had lower AS scores after participating in the group drumming sessions. Within the control group, only 30.8% (n=4) of the participants had lower AS scores than at the time of the pre-test. The median AS score of the control group remained stable between the pre-test (median 22) and post-test (median 21), while the median AS score of the intervention group showed a marked decrease from the pre-test (median 20) to the post-test (median 7). Although the difference in pre-test and post-test scores of the intervention group was not significant (95% CI [ -13 ; 5 ]), a significant difference was found between the median post-test scores for the intervention and control groups (95% CI [ -28 ; -3 ]). This finding, in addition to the majority of participants in the intervention group displaying lower AS scores after the intervention, is promising. This suggests that group drumming may be an effective intervention for the reduction of aggression among adolescent girls diagnosed with conduct disorder within a school-based setting. The results of this study support the findings of Bittman, Dickson and Coddington10 as well as Currie and Startup11 who found that group drumming sessions may lead to decreased aggressive behaviour among adolescents. Bittman, Dickson and Coddington10 conducted a randomised control crossover study of adolescents placed in a court referred residential treatment programme. Group drumming sessions were held and a significant decrease (p=0.002) in instrumental anger (aggression) was found as measured by the Adolescent Anger Rating Scale (AARS)10. Currie and Startup11 used a percussion programme, Doing Anger Differently, with a group of adolescent boys with identified aggressive responses to anger. These authors found a large decrease (p<0.0l) in aggression, which was maintained six months after the programme ceased. The findings of the study reported on in this paper demonstrate that occupational therapists have an important role to play in the treatment of conduct disorder through occupation-based interventions, such as drumming. In addition, these results contribute to the limited body of knowledge on interventions for girls with conduct disorder12. This study was limited by the relatively small initial sample size (n = 32), which was further aggravated by participant drop-out leading to a final sample size of 26. The initial sample size was restricted due to the availability of drums and skilled facilitators. In future studies, we propose a larger initial sample size to compensate for participant drop out. The results of this study necessitate further research into the long-term effects of a group drumming program on aggressive behaviour of adolescents with conduct disorder. Aggression has been shown by a 22-year longitudinal study to be the strongest predictor of criminality for individuals diagnosed with conduct disorder.44 If the short term results reported in this study can be maintained over the long term, this may have important implications for targeting youth at risk of aggressive behaviour and criminal acts. Further recommendations would be to conduct qualitative research into the underlying mechanisms in the reduction of aggression to provide a deeper understanding of the group drumming process and how it facilitates constructive responses to anger. Of particular interest to occupational therapists would be to explore the resultant reduction of aggression, through group drumming, on other occupational performance areas such as school performance and interpersonal relationships. It may also be relevant to investigate the ways in which the therapeutic relationship between group drumming participants and the drumming facilitator contribute to the effectiveness of the intervention. Group drumming shows promising results as an occupation-based intervention that may lead to the short term reduction of aggression among adolescent girls diagnosed with conduct disorder. This study introduces a largely unexplored field in occupational therapy as it attempts to bridge the gap in literature between occupational therapy, group drumming, and aggression as it presents in adolescent girls with conduct disorder. Further research into the long-term effects of group drumming is essential to establish group drumming as an evidence-based intervention for occupational therapists practising in the South African context to improve behavioural outcomes for adolescents with aggressive behaviour. The authors would like to extend their sincere appreciation to the principal, staff and learners of the school where the study was conducted. 1. World Health Organization. World report on violence and health: summary [Internet]. [ Links ] 2002. Available from: www.who.int/violence_in-jury_prevention/violence/world_report/en/summary_en.pdf. 4. Department of Social Development. Child Care Act no. 74 of 1983 [Internet]. [ Links ] Department of Social Development; 1983 p. 1-52. Available from: www.dsd.gov.za/dmdocuments/Child_Care_Act.pdf. 8. Wright S, Day A, Howells K. Mindfulness and the treatment of anger problems. Aggression and Violent Behavior [Internet]. [ Links ] Elsevier Ltd; 2009;14(5):396-401. Available from: http://dx.doi.org/I0.I0I6/j.avb.2009.06.008. 29. Baker K. Conduct disorders in children and adolescents. Paediatrics and Child Health [Internet]. [ Links ] Elsevier Ltd; 2009;19(2):73-8. Available from: http://dx.doi.org/10.1016/j.paed.2012.09.007. 34. Kostic J, Nesic M, Stankovic M, Zikic O. Perceived parental acceptance/rejection, some family characteristics and conduct disorder in adolescents. Vojnosanitetski pregled [Internet]. [ Links ] 2014;71(10):942-8. Available from: http://www.doiserbia.nb.rs/Article.aspx?ID=0042-84501410942K. 40. Hamburger ME, Basile K, Vivolo A. Measuring Bullying and Bystander Experiences : A Compendium of Assessment Tools. Centers for Disease Control and Prevention [Internet]. [ Links ] 2011;9. Available from: www.cdc.gov/violenceprevention. 42. Atay E. Impact of sports and social activities participation on aggression level. International Journal of Academic Research [Internet]. [ Links ] 2013;5(5):169-73. Available from: http://www.ijar.lit.az/pdf/ijar/2013(25B-25).pdf.